The brief tank battle at Cologne Cathedral is perhaps the single most famous tank duel of all time. To understand what was really going on there, it is necessary to take a look at the strategic situation and Cologne Cathedral itself. A view from the east side of the river, showing the blown bridges. The Germans had been chased out of France and had expended their reserves in the Battle of the Bulge aka the Ardennes Offensive aka the Von Rundstedt Offensive. This had led to a delaying action by the Germans along the German border throughout January and February 1945, during which they were slowly pried out of the Rhineland with great difficulty. The British and the Americans then closed up upon the Rhine River. Reaching the Rhine, though, was a lot different than crossing the Rhine. As can be seen, behind the cathedral is a railroad bridge, which ostensibly needed to be kept out of Allied hands because river lines typically formed German defensive perimeters. However, by the time of the shootout, that bridge had been bombed into ruins as seen in this picture, and any usefulness to it would have been removed by demolition before the Allies approached. 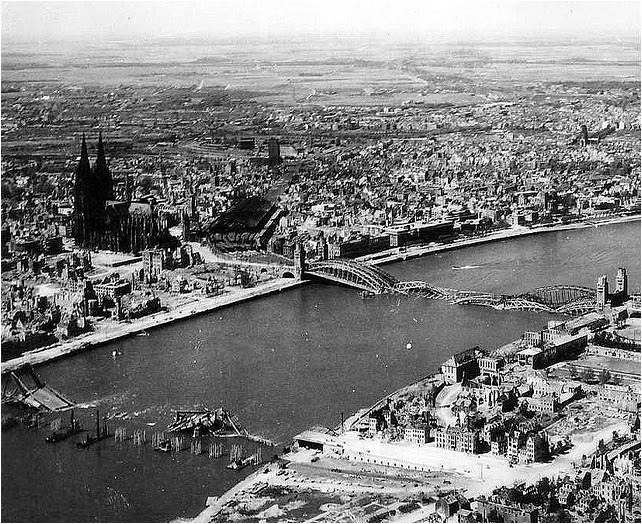 Cologne goes back to the Roman days and straddles the Rhine, with roughly half on either side. The old part of town was on the western side, crowned by the famous Cologne Cathedral. The cathedral is a Roman Catholic church that was built over an 800-year time frame, with work starting in 1248 and, after a long interruption, work finally was completed only in 1880. Perhaps the only thing that saved the Cathedral was that it was made of stone, and thus did not burn down, as well as the large clear spaces separating it from buildings that did burn. 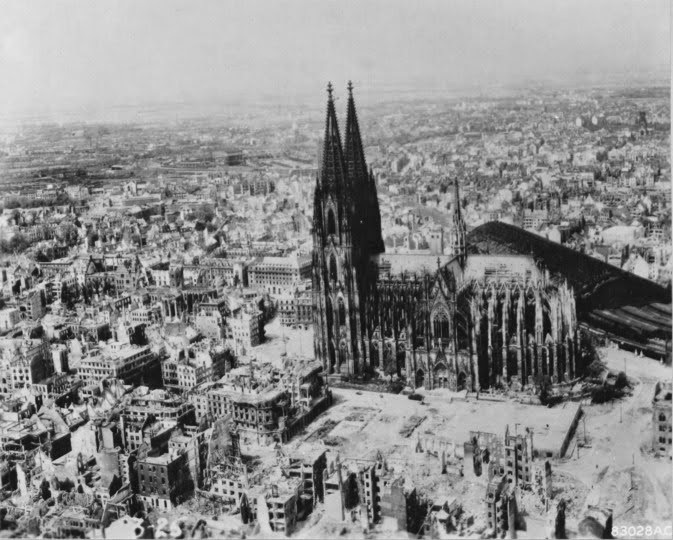 The cathedral's completion was an event of national significance, symbolizing as much the unification of Germany out of squabbling individual kingdoms as a work of architecture. It also took place at the summit of German military achievement, coming shortly after the Franco-Prussian war when the Germans unexpectedly defeated arch-enemy France. 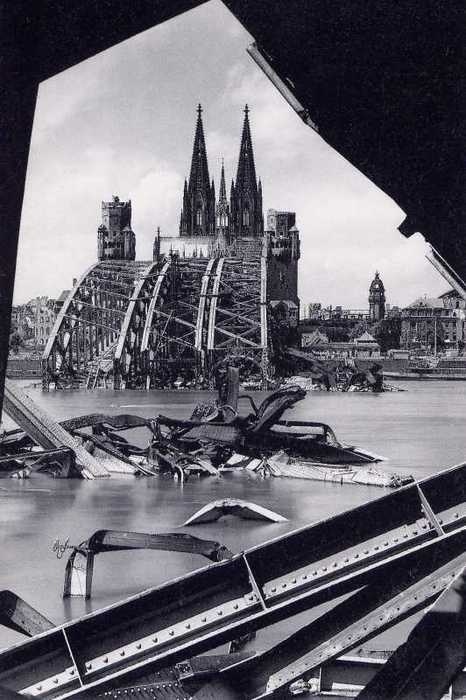 Hohenzollern Bridge, Cologne 1945 -- Karl Hugo Schmolz. Bavarians might not think much of Prussians, and Prussians might not think much of Swabians, but they could all pretty much set aside their differences and take pride in the completion of the Cologne Cathedral. Cologne was a devastated, smoking hell. 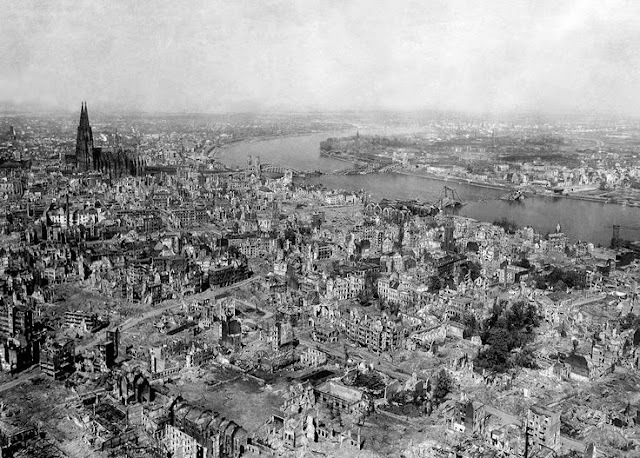 Being the closest major German city to England, the Allies had bombed it repeatedly during the war. 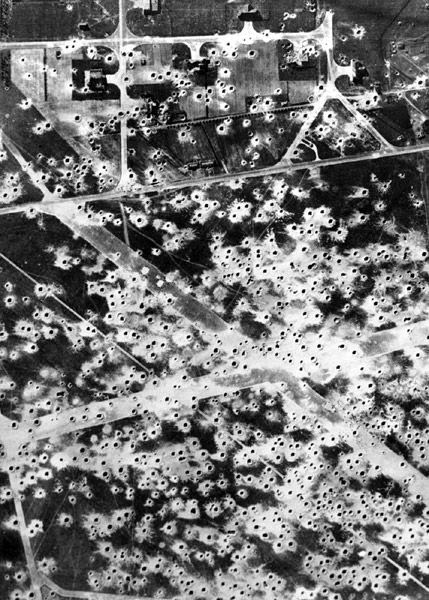 The Allies had launched no less than 262 air raids against it by March 1945, including the first 1000-bomber raid ever assembled against any target on May 31, 1942. Cologne had been paying the price of the war earlier and harder than anywhere else in Germany, and it had lost 95% of its population. 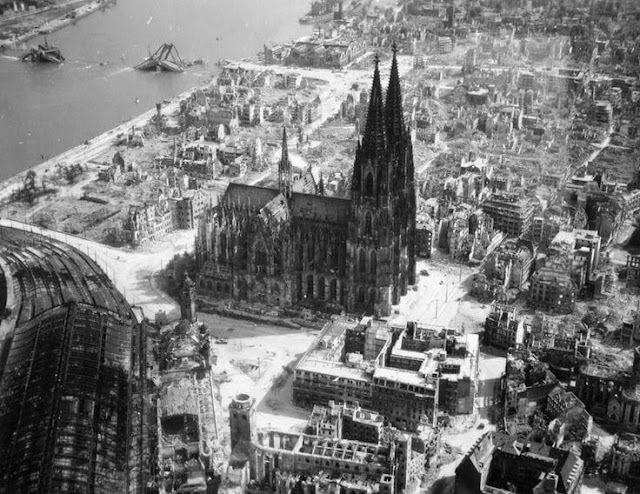 In essence, aside from absolutely essential personnel and a few troops, Cologne was nothing but a deserted shell, of no value to anyone except as a place on the map to occupy. 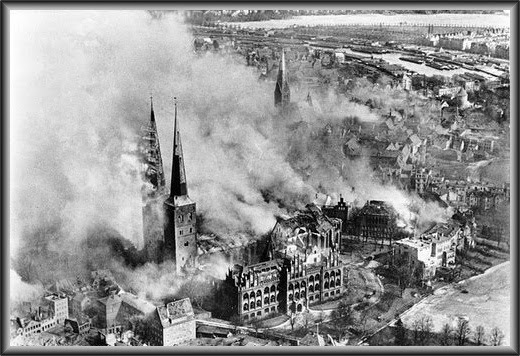 Cologne and the cathedral smoldering after a 1000-bomber raid. Cologne Cathedral itself had been hit by the bombing, but it remained intact and, from a distance, appeared impervious to the war, like an artificial heart that continues beating after the patient has died. It is difficult to wipe out a building that took almost a thousand years to finish, though hardly impossible. Its survival amidst the devastation was viewed with a mixture of awe and astonishment by the Germans, regardless of whether they were Party members. The spires of the cathedral loomed above a wasteland of rubble and piles of debris, damaged and scarred: but it still stood. Its symbolism only grew - it was the living, beating heart of the true German soul, the one that pre-dated Hitler by centuries. Berlin, which many foreigners consider the heart of Germany, was founded about the same time as construction began on the majestic cathedral. However, Berlin did not have nearly the same sort of significance, being merely the capital of one of many competing German states. Many Germans would refer to Berlin with something approaching disdain, as in "Oh, Berlin is calling again" - but they typically felt genuine affection for the stately church. A Sherman Tank, crew posed for the camera. On March 6, 1945, there were as yet no Allied forces across the Rhine - the Remagen Bridge further south would not be taken until the following day. The Germans were fleeing to the far bank of the Rhine about as quickly as they could get there in order to prevent Allied river crossings. There was little point in fighting and dying on the west side of the Rhine when the great river afforded maximum protection and was the new defensive perimeter. The Panther, protecting an intersection as they always did. The church would be to the left, behind it. The American tank came down the street here parallel to the one the German tank is on and shot on the run. Note the absolute devastation on this random Cologne street. 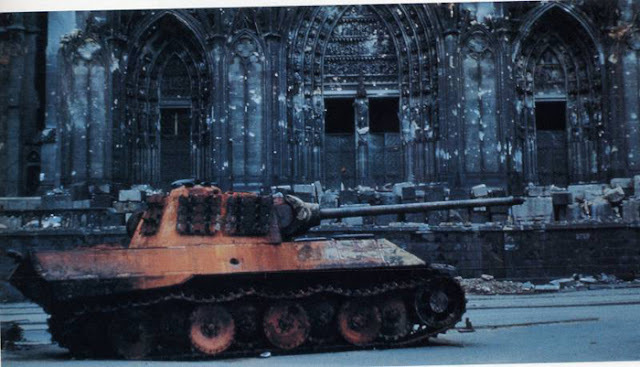 US 3rd Armor Division entered the city that day after hard fighting to the west. 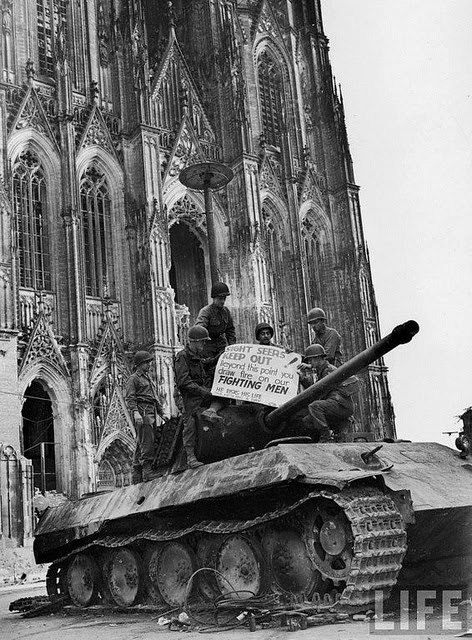 Two medium M4A4 Sherman Tanks were supporting infantry as they advanced toward the river and the cathedral along the main road, the Komedienstrasse. There was too much rubble in the streets, though, so they stopped just short of the cathedral. At that point, the lead Sherman was hit by a round fired by a German tank, destroying the tank and killing three of the five crew. The GIs quickly discovered that the enemy tank was a medium Panther Ausf. A (an older model - the most recent was Ausf. G) with a command cupola that easily could handle a Sherman tank. That it was an older model was evidenced by the fact that it had Zimmerit anti-magnetic paste on it, which had been discontinued the previous winter due to fire concerns and the fact that it added production time. Cologne, Germany, March 6, 1945: US tank driver Julian H. Patrick, still sitting in the driver's seat, is dead after suffering the effects of a direct hit from a German Panther during the Battle of Cologne Cathedral. 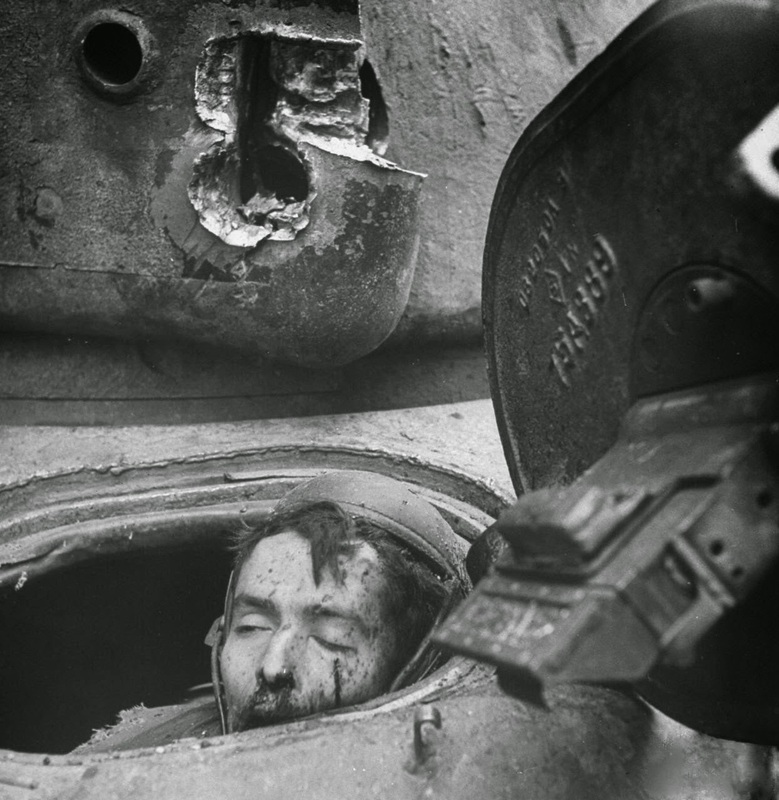 Note the hole in the tank's turret, above Patrick's head, from a direct hit.The tank commander died in the turret, the gunner was seriously wounded but survived, and the assistant driver exited from the escape hatch and survived unharmed. Therefore the other Sherman, realizing it was no match for a Panther, withdrew, and the soldiers called on a nearby T26E3 (Pershing) for assistance. Then, wisely, they waited. 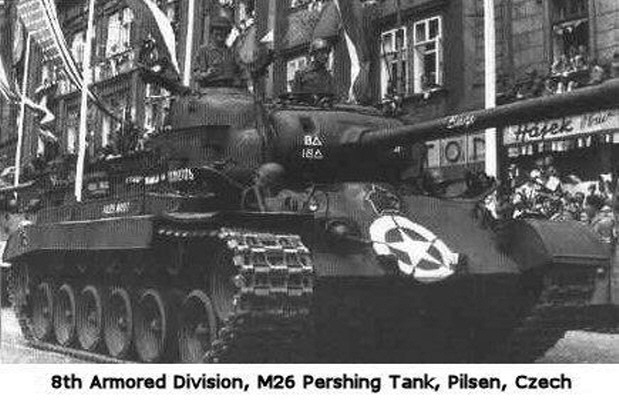 A US T26E3 Pershing M26 Tank. 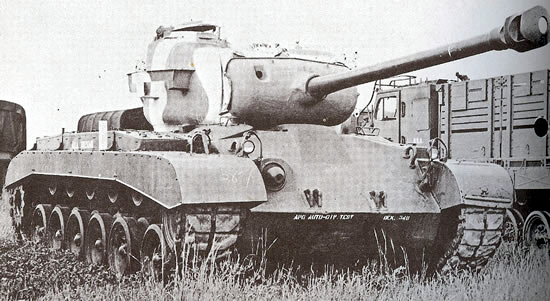 The US T26E3, the production version of the T26 series, was a phenomenal tank, and very rare. 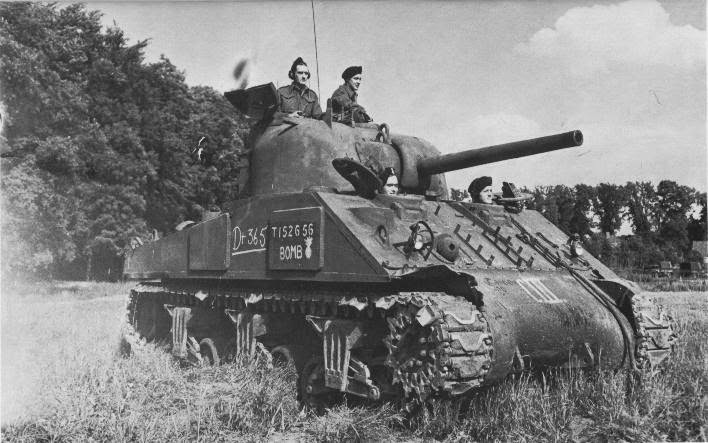 It was the culmination of US tank development during World War II, which many wrongly think ended with the ubiquitous Sherman. The T26 had a massive 90 mm gun mounted in a new turret and included a front glacis plate with 4 in (10 cm) of armor. 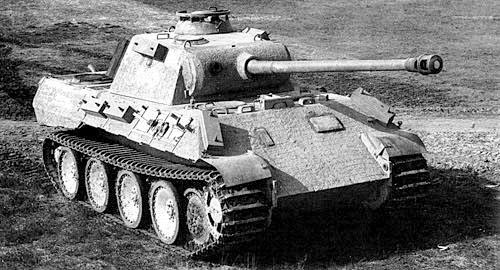 The weight of the T26 series was over 40 short tons (36 t), putting it in the heavy tank category but below a panther (about 45 tons). This was a beast to be reckoned with. The designation was changed to M26 shortly after the Cologne battle. There were only 240 T26E3's in existence anywhere in the world, and only 20 of those were in Europe during the war. "U.S. troops and German civilians were in awe of seeing the M26. Some troops thought it was a captured German tank." 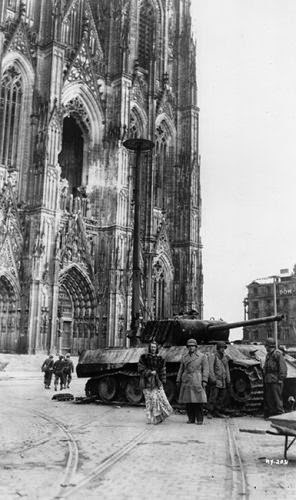 Needless to say, that there was a T26E3 at all in Cologne, much less one only a few streets over, was a phenomenal stroke of luck for the advancing American GIs. The T26E3 was not the world's best tank by far - it had much narrower tread than the King Tiger, for instance, and the armor and gun were not quite as capable - but it was worlds better than the Sherman and could take on any tank in the world on fairly even terms. It was at the very least equal to a Panther, probably a bit better, but not dramatically so. This aerial shot gives a good idea of the strategic idea behind the battle. The cathedral looks impervious, but it took 70 bomb hits during the war. The German tank would have been just to the left of this photo, with the American tank farther left still. The bridge was blown, so the tank had nothing to defend... or did it? The crew of the Pershing was: Tank Commander Robert Early, Asst. Driver Homer Davis, Gunner Clarence Smoyer, Driver William McVey, and Asst. Gunner John Deriggi. One of the 20 Pershings in the ETO. This was their furthest advance in Czechoslovakia. The Pershing started over and was driving on a parallel street, the Christophstrasse. 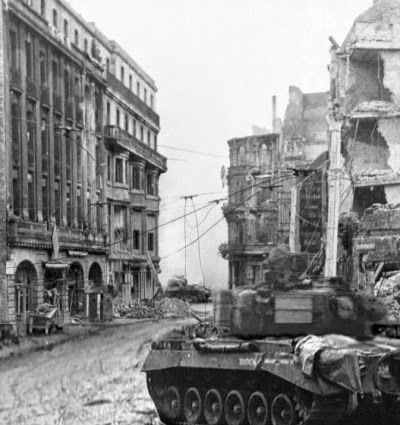 When it reached the corner Christophstrasse and Marzellenstrasse, it saw the Panther, stopped briefly, and then resumed its movement and opened fire while on the move. This was the situation, the Pershing in the foreground, Panther in the background. 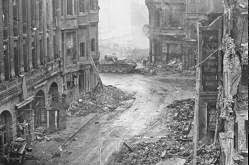 "We were told to just move into the intersection far enough to fire into the side of the enemy tank, which had its gun facing up the other street (where the Sherman had been destroyed). However, as we entered the intersection, our driver had his periscope turned toward the Panther and saw their gun turning to meet us. When I turned our turret, I was looking into the Panther's gun tube; so instead of stopping and becoming an easy target, our driver kept going through the intersection, so I fired a round and hit the enemy tank. The Panther was dispatched and burned for 3 days after the duel, with 2 of the crew surviving." So, moving along the street and not stopping for long so as not to present a target, the US tank took a quick pot-shot at the German Panther and scored a direct hit. One can well imagine the feeling of the tank driver seeing the Panther sitting there waiting for him, and the gunner seeing the Panther's gun pointed straight at him, about to fire. Why the Panther hesitated and didn't fire in that instant, when it had the split second it needed to wipe out the American tank, we'll never know. It could have been simple confusion - the Pershing was an extremely rare tank, and the Germans may have mistaken it for another German tank, what with all the talk of "secret weapons" and the like. Or, it could have hesitated for any number of other reasons, such as trying to line up the perfect shot, the gun jammed, etc. There is conflicting evidence. American tanks were not known for shooting on the move, that was pretty rare and the German tanker may have been surprised that the US tank fired while on the move. The Germans fleeing their burning tank. In the German tank, four got out of the tank and three survived. The Commander was 1st Lt. Wilhelm Bartelborth (sometimes spelled Barthelborth), chief of 2./PzAbt 2106 of Panzerbrigade 106 Feldherrenhalle (2nd company, 2106th Armored Btl., Armored Brigade 106). His brigade was formed on 28 July 1944 from the remnants of Panzergrenadier-Division Feldherrnhalle at Mielau. Bartelborth survived the battle, along with another man named König. A third man also got out alive but did not last too long after the battle, dying either days or weeks later (records at the time were skimpy and it was an extremely dangerous time to be wearing a German soldier's uniform). At least one man died inside the tank, burned to death. The three survivors were later caught by a group of 30 policemen and men of the Volkssturm. Upon being questioned about the battle, they claimed that they intended to wait for the Pershing to stop before shooting. This shot gives a good indication of how shot-up the Cathedral was. Panther commander Bartelborth was no shirker: he was a Holder of the Honor Roll Clasp of the Heer. Bartelborth died before anyone in the media could ask him what happened, but he did talk to his family about the incident. 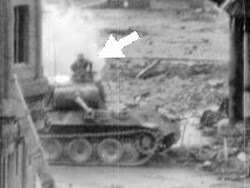 His daughter said in the documentary "Köln 1945 Nahaufnahmen" that her father had told the family that the tank that had appeared in that situation on the street corner, should have been a German tank. Bartelborth probably expected a Sherman tank and the tank was not a Sherman tank, and he had undoubtedly never seen a Pershing before. As Smoyer said in the quote above, the T26E3 was often mistaken for a German tank. A moment of confusion by Bartelborth followed, and he hesitated. He was taken by surprise and did not give the order to fire instantaneously in fear that he would destroy one of his own tanks. That's the difference between life and death in battle. A Tank Commander named Robert Early from E Company 32nd. Armored Regiment went on foot to investigate. I asked to go along and we went on the mezzanine of a building and saw the tank. He told me to stay there and he would come back in his tank and try to put the German tank out of commission and I could photograph it. He had one of the new M-26 Pershings with a ninety-mm gun. Sgt. Early said he would turn into the square under me, stop and fire at the German tank. A question seldom asked is why these Germans were sitting in that spot waiting patiently for the Americans. Some cryptically refer to it as a "last stand" sort of deal, common during 1945. Well, in this author's view at least, it indeed was a sort of last stand, but not of the type many probably think. It was not the last stand for Hitlerism or anything like that. Cologne Cathedral was the symbol of Germany. It stands outside of politics. It is a source of national pride and, in a very real sense, symbolizes the German soul. These Germans easily could have turned tail and found their way across the river before the last bridges were blown. However, they chose to make a "last stand" in front of the symbol of Germany, a symbol which had absolutely no military value. It made absolutely no military sense, but they were not thinking in military terms. They were fighting for something here, but it wasn't Hitler. Imagine the last group of American soldiers parking their tank in front of the Washington Monument, with Washington D.C. in ruins, and saying "Come and get me you lousy (&)()(*@ we don't care anymore." They wouldn't be upset because of who happened to be in the White House at that moment. You get the idea. 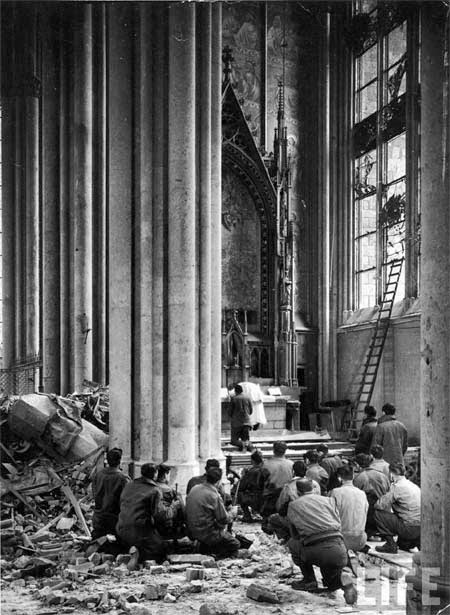 Picture by war correspondent Margaret Bourke-White: some American soldiers attend Mass in March 1945 inside the bombed cathedral of Cologne. The strange reaction by the American GIs immediately afterward, with their famous "No Sightseers! Keep Out!" sign, is an indication that they, at the time, realized that this spot and incident was unusual and worthy of special respect. They no doubt understood that brave men just like themselves had fought and died there for a worthy purpose, and it wasn't a cause that had anything at all to do with politics or the regime. This is an extremely rare occasion where there is actual footage of a tank battle. If there are any cases like this, we're not aware of them. Not to pick on anyone in particular, but the tank battle remnants quickly became a tourist photo op site due to the scenic surroundings. Here, it is Lily Pons and Andre Kostelanetz posing with the shattered tank. This annoyed some of the fighting men, some of whom, it appears, are standing in the background here and taking note of the proceedings. There were ordinary people still in the vicinity of the Cologne fighting. Why they stayed... you'd have to ask them. However, running isn't always possible - and where do you go when the fighting is everywhere? Numerous civilians perished during the fighting or simply from being run over during vehicle movements, and usually not in a pleasant way. The bodies very often were left where they fell. Even injured people briefly attended by medics were left lying in the gutter - there was nowhere to take them and trying to move them could expose you to fire from bitter-enders in overlooking buildings. The victims are almost all anonymous. 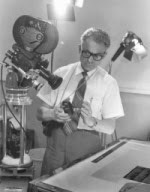 A few gained some notoriety from making the newsreels and later documentaries - but they still died. All of this affected soldiers on both sides at the time and long after the war. 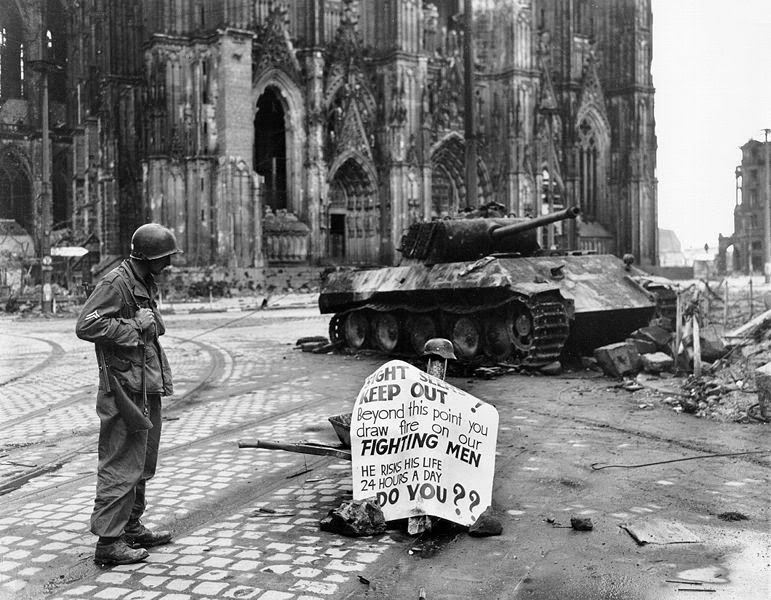 U.S. soldiers were not used to hard fighting in large cities like Cologne, most of it took place in the countryside or along river lines. Seeing victims everywhere was difficult. There were unusual expressions of grief in Cologne Square. He risks his life 24 hours a day. Below is a good sequence of combat footage from the war. The Shootout at Cologne Cathedral features at the 3:10 mark. And finally, some additional footage that was taken by Jim Bates in and around Cologne. Very interesting! 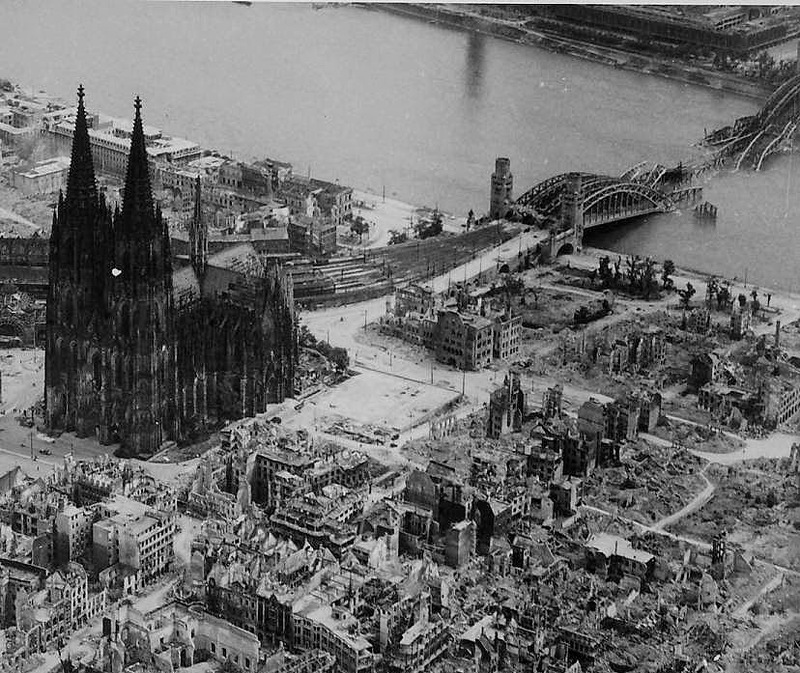 Just returned from seeing Cologne Cathedral and wondered about the extent of damage to it during the war. Thanks for completely covering the topic! Thanks, ebor. I, too, have stood in the shadow of the great cathedral, which hearkens back to days of grandeur and piety. You are welcome. In the photo that has Patton standing in fron of a tank, it is stated that it is a Pershing, but it is in fact a M4A3 (76). You can tell the difference by the shape of the turret, shape of the transmission, hull side, shorter gun (76mm M1 as opposed to the 90mm M3 on the Pershing) and overall smaller size of the tank. You have a good eye. I switched pictures. I should have known by the relation of the size of the soldier to the size of the tank. Thanks! It's worth noting that in the film footage of the Pershing taking out the Panther, you can see that the Panther is actually hit 3 times. The first hit isn't in the footage, which starts with the tank already starting to burn and the commander bailing out. While the final Panther crew man (I believe it is the gunner, as he is coming through the commander's hatch) is struggling to get out a second shell goes into the tank. After that there is no sign of the struggling crewman. A final shell hits the Panther shortly after and the tank really starts to burn then. The whole event, and the other footage from Cologne, show just how horrific, brutal and chaotic the street fighting in German towns and cities was.